Uniform nuts are a big plus with Gorilla Chrome Small Diameter Tuner lug nuts. 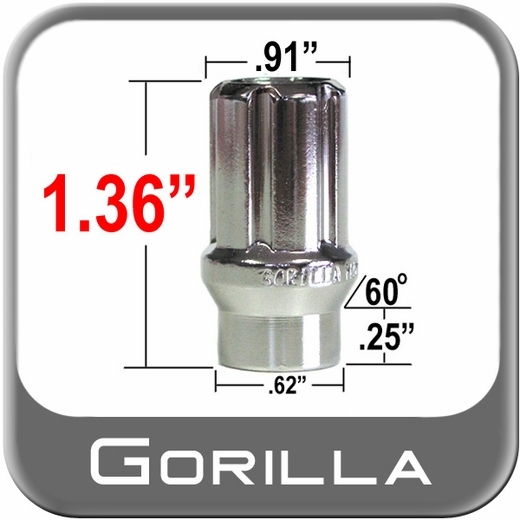 These Gorilla Chrome Small Diameter Tuner lug nuts are triple Chrome Small Diameter Tuner plated for a great look. Quick replacement is a plus with Gorilla Chrome Small Diameter Tuner lug nuts. A new set of custom wheels won't look custom without a new set of Gorilla Chrome Small Diameter Tuner lug nuts.